Paying a hearty tribute to the gallant lost souls and survivors of the 2014’s Army Public School terrorist attack in Peshawar, Ali Azmat is all set to release a moving song with the strong message of “Yeh Jung Bhi Hum Hi Jeetey Gey”. While the whole nation unites to commemorate the first anniversary of the deadly catastrophe that took precious lives of young students, some prominent stars of Pakistan’s entertainment industry have come together in the video to be a part of Azmat’s musical dedication. View the teaser of the upcoming tune below as shared by Ali Azmat on his FB page. Celebrities including Hina Dilpazeer, Sarwat Gilani, Javeria Saud, Aijaz Aslam, Naveed Raza and Faysal Quraishi are spotted in the star-studded teaser. Meanwhile, the singer sports a rough and tough look of a hot-blooded commando, ready to fight for his beloved homeland. 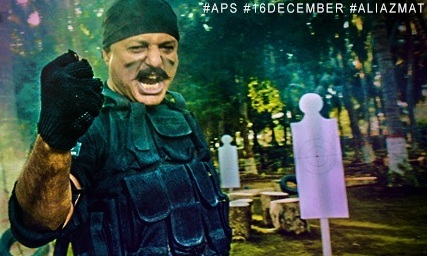 Also, check more of Ali Azmat’s macho look here along with his powerful note in the memory of the APS massacre. View BTS from the making of the song. Shot in Karachi, the song will be rolled out on 16th December 2015. Previous articleAamir Liaquat Resigns As Geo Entertainment President!